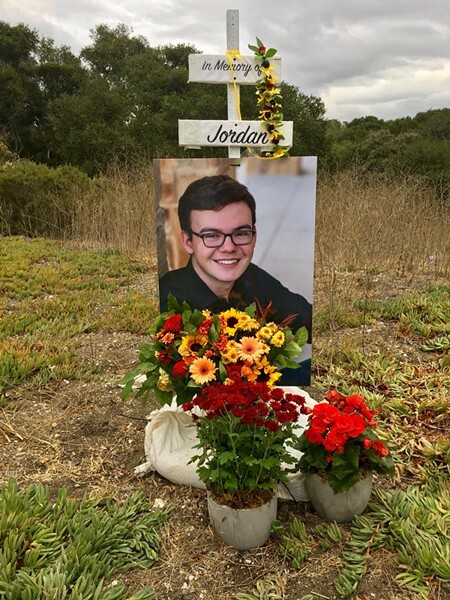 The recent death of a Cal Poly freshman at the El Campo Road intersection on Highway 101, spurred community members to call for urgent short-term and long-term solutions to the hazardous road. REMEMBERING LIFE After their son, Jordan Grant, died in a motorcycle accident, James and Becky Grant are asking for a change at the El Campo intersection on Highway 101. At the Dec. 5 San Luis Obispo Council of Governments (SLOCOG) meeting in the Board of Supervisors chambers, the council approved a $30,000 traffic impact analysis of the potential closure of El Campo Road intersection on Highway 101. The room was filled with people wearing black shirts with a photo of Jordan Grant. The first-year computer science student was killed in a motorcycle crash at the intersection. According to the California Highway Patrol (CHP), Grant was driving his motorcycle on Highway 101 when a BMW was in the process of making an unsafe left turn directly in front of him. Grant slid into the left side of the car and was fatally injured. Among the 24 public commenters—including Grant's parents, James and Becky Grant—were four individuals who gave tearful testimony about how they suffered serious injuries in traffic collisions at the intersection. While the collective comments advocated for the county and Caltrans to stop left turns across the highway or to close the intersection altogether, some commenters said that closing the intersection would eliminate an emergency exit route or inconvenience their daily commute. According to the SLOCOG staff report, collision data from the Statewide Integrated Traffic Records System show that from September 2012 through Dec. 31, 2017, 16 collisions occurred, none of which were fatal. In 2018, two collisions occurred with one fatality, Grant's, occurring on Oct. 7. This isn't the first time a study has been conducted on the intersection. In a 2011 study, Caltrans assessed the construction of concrete median barriers along the inside shoulders of Highway 101 from the Los Berros Road undercrossing to Traffic Way in Arroyo Grande. An alternative to close the existing intersections was part of the study—including El Campo Road. The alternative was rejected. At the Dec. 5 meeting, Caltrans officials said they are ready to act on a solution, but need local consensus on what that solution is.